1. In 2012 Vermont law changed to require public reporting of immunization rates by school district. According to the VT Dept of Health what percentage of Montgomery’s 111 school students were fully immunized for the 2012-2013 school year? 2. Was the Montgomery rate greater or less than the Statewide rate? 3. Was the Statewide rate greater or less than 90%? WE DID IT!! Last year at this time we announced the official start to the West Wall Capital Campaign (WWCC) to raise the funds needed to make much needed structural repairs to the west wall of Pratt Hall and safeguard the priceless stained glass windows. Our goal was $150,000 and we are thrilled to report we have grossed cash, grants and pledges of about $165,000 as of the end of June. WWCC Chairman, Tim Chapin, wanted everyone to know how humbled and grateful he is for the support. “On behalf of the West Wall Capital Campaign Committee, THANK YOU. This is a great little community, that has only to be asked, and whatever the goal, it's done." Kudos to the Committee members, Tim, Bill McGroarty, Patty Perl, Sue Wilson, Marijke Dollois, & Pat Farmer. Also great credit for support from ALL the Board including Parma Jewett, Elsie Saborowski, Ken Secor, Mark Baddorf, John Beaty and Jo Anne Bennett. Thank you. Lastly thanks to all of our members and supporters who made cash donations, patronized our fund raising events, and provided your energy and enthusiasm for our effort. Words fail me in expressing our gratitude. Now that we have the financing we'll start the real work!! Hall prep will begin the week of July 13th with the removal of the west side pews, oil chandeliers, organ, display case and floor vent covers. We expect the stained glass window removal to take place the week thereafter and demolition to start in early August. Jan Lewandoski, Traditional and Restoration Builders will be the General Contractor. Larry Ribeckke, Vermont Stained Glass, will be a subcontracted consultant for the Stained glass window removal, light restoration, and re-installation. Work is expected to take three to four months. On June 29 TD Bank's Michael Pressman confirmed we would receive a fifth donation under the bank's Affinity program. Changes to the program reduced the amount but we still qualified for just over $2,500 bringing our five year total under the program to over $36,000. The MHS was one of the only non-profits in Vermont to qualify for an award this year under the new program guidelines. Thanks to TD Bank and thanks to all of our 80+ members with TD accounts who have designated the Society as their Affinity beneficiary. Our bylaws require us to have an Annual Meeting every June to provide a "State of the Society" report and elect Board members and officers. This year's was June 29th. 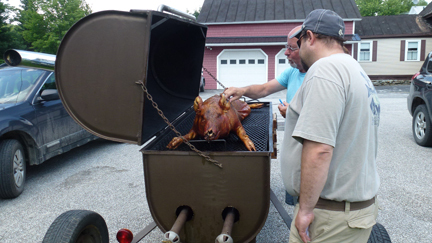 Seventy-seven members and their guests were treated to a pig roast featuring Dennis Deuso's roasted porker and Parma's potato salad and coleslaw. 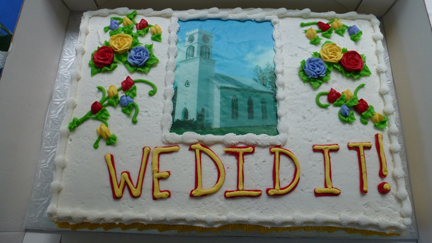 We celebrated our fund raising success with cake, all under the big tent on the lawn. Here's a link to our Annual Meeting program. This year's scholarship winner was Kerianne Little. 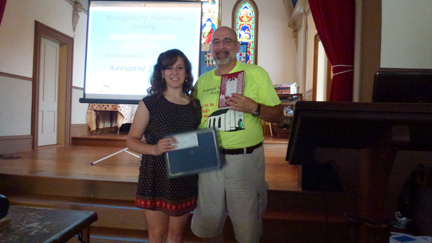 Beside the glory Kerianne received $500, a certificate, and a copy of the Montgomery Town History. Kerianne will be attending UVM in the fall where she hopes to major in biology and eventually become a veterinarian. Congratulations and good luck to Kerianne and her parents, John and Ruth! Thanks also to our selection committee, Rita Kalsmith, Patty Perl, and Patty Hathaway and to Marijke Dollois for getting out the applications to all Montgomery Seniors every year. The 3rd Edition continues to sell well. Joe Sherman, who wrote the 2nd Edition's Chapter 10, and Jo Anne Bennett who wrote the 3rd Edition's Chapter 11 will be at our tent on August 23rd during our Open House (and the Covered Bridges Garden Club's Harvestfest) to sign copies. If you've already bought yours, bring it by and get it signed. Books will be available for sale too. 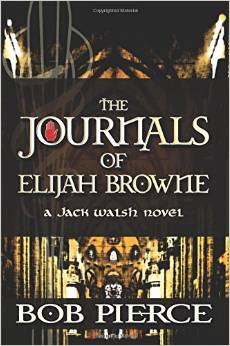 We have a very limited number of hard cover 3rd Editions signed by Bill Branthoover, who wrote the 1st Edition (Chapters 1-9), for sale as well so there will some opportunity to collect a copy with all three autographs. 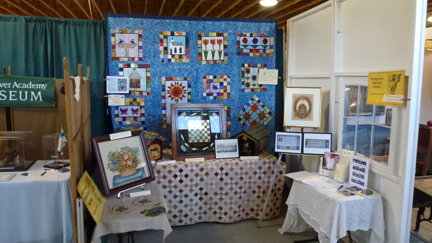 While the WWCC is officially over we will be selling quilt raffle tickets until August 23rd (at our Open House). They can also be purchased at Lutz's, online, or from any Board member. People have also expressed interest in the engraved brick pavers, which we continue to sell as long as there is demand. They also can be purchased online or by calling Board member Pat Farmer. 2. Montgomery's rate was less than the State average. 3. More. The State average was about 92%. 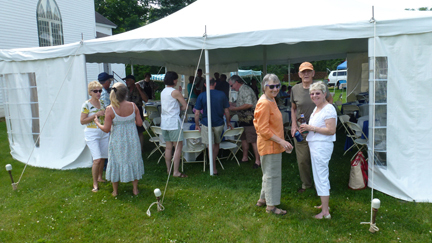 The Society's annual program was at the Clapp Cemetery in the Village and was well attended despite a shower. Our guest speaker was Andre LaBier, in person this year. 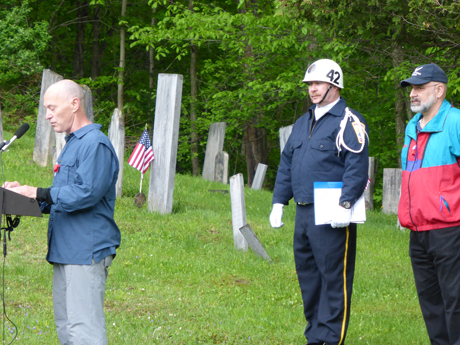 Our thanks to roll call reader Sue Wilson, and American Legion Post 42 (Enosburg) for supporting our annual observance and Richford American Legion post 12 for placing flags on Montgomery veteran's graves. And to Parma Jewett for donuts, and drinks. Our 2014 membership drive is well underway (click the link under Annual Meeting for a snapshot) We will be sending reminder notes out soon. Please join or rejoin us... every member matters! New MHS Sign Is Up!! Thanks to Robert Gendron and Dan Malloy who teamed up to create a new work of art to grace the Hall. 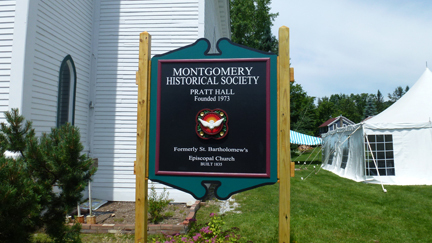 Robert reconstructed the sign including new painting, molding, and lettering. Dan made a hand carved three tiered quatrefoil inspired by the holy spirit quatrefoil from one of Pratt Hall's stained glass windows. 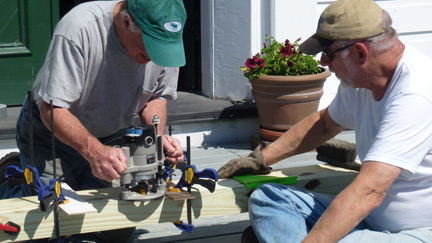 The Men with Tools installed a new mount and it was unveiled at the Annual Meeting. 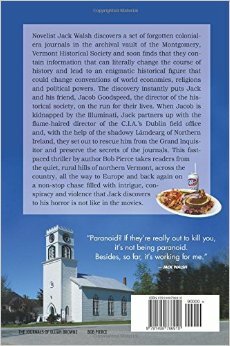 Vermont author Bob Pierce contacted us for some genealogy information a while back and we learned he was writing a novel which is set in part in Montgomery and Pratt Hall, and uses references to the community, from our web site, and a lot of imagination. The plot involves documents found in the fictional MHS archives vault, and the Society director, Jacob Goodspeed, is a major character. References to local names and places are rife and Pratt Hall even graces the back cover. Stand by for the onslaught of book-tourists! The MHS exhibited at the Vermont State History expo at Tunbridge in June. Our exhibit was titled "Creative Montgomery: A Sampling of Uncommon Decoration" We featured Illumination Artist Carl Tcherny who lived with his wife, also an Illumination artist, on the Hazen's Notch Rd. 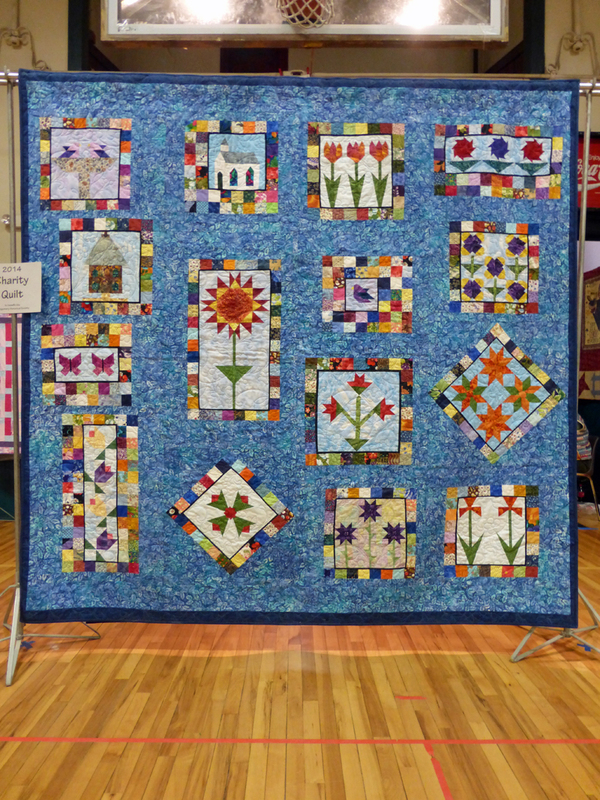 We also featured examples of Early American Decoration and Quilting. We made an effort to show items that no other exhibitor would have. This link is to the guide we prepared for our exhibit. Our thanks to Parma Jewett, Bill McGroarty, and Peggie Fagan for loaning items and providing background information and to Parma and Sharon Perry who demonstrated their work. Thanks also to our docents Parma Jewett, Elsie Saborowski, Sue Wilson, Marijke Dollois, and Susan Baddorf. Mark Baddorf joined the MHS board this spring and was elected with the slate of officers at the Annual Meeting. Mark and Susan, his wife, are now Montgomery full timers and live on West Hill. Welcome aboard! July 1979: Montgomery's Rec Center officially opened. 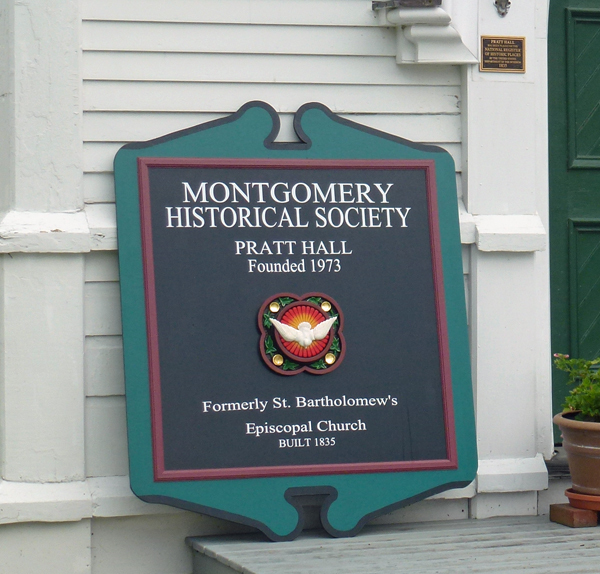 August 1802: Montgomery's first Town officers chosen. 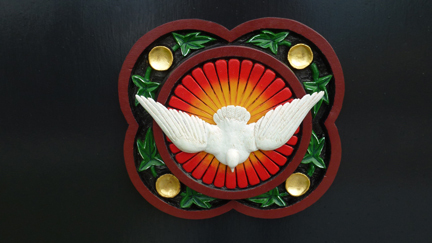 September 1908: The Hectorville Union Chapel is dedicated. Six MHS members attended a meeting of the Franklin and Grand Ilse counties societies in May in Alburgh. 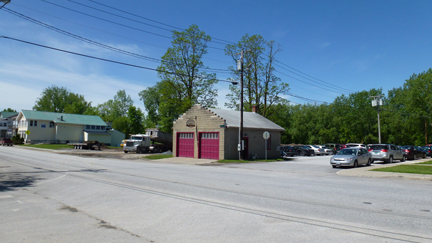 The Alburgh Society had several presentations, and showcased their new building, a former train station site and fire station. It's right on Main Street but call ahead for hours.